Love, laughs and lunch at The New Orleans School of Cooking. I come from a long line of cooks on both sides of my family. But there are some things I never picked up on my own. My grandmother was known for making a mean jambalaya, but all I got from her was how to make biscuits. Growing up in the big city might have been part of that. Most of what I’ve learned about cooking outside my small south Arkansas culture has been as an adult, through TV and books and cooking classes taken whenever and wherever I can. And just about every time I find myself in New Orleans I end up at the New Orleans School of Cooking. 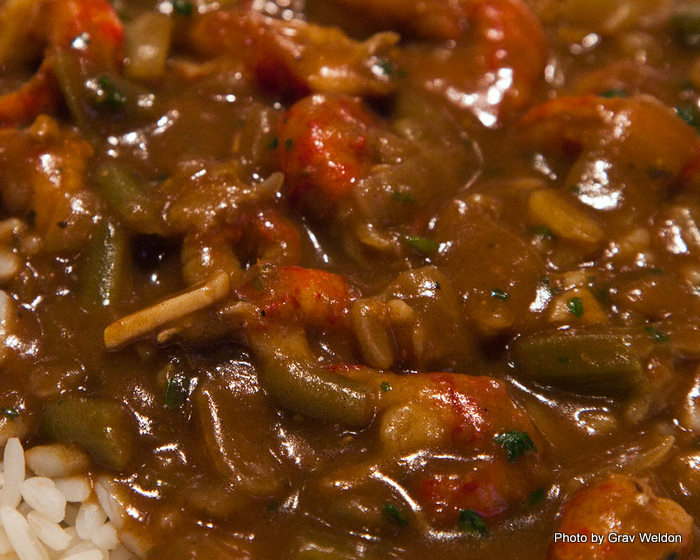 Classes are offered every day on everything from gumbo to red beans and rice and everything in-between. But I don’t just go for the knowledge. 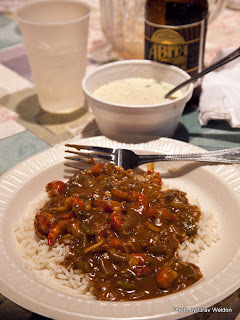 I go for the food -- the school’s food is some of the best Cajun and Creole fare you’ll get in the French Quarter. And I go for the stories. 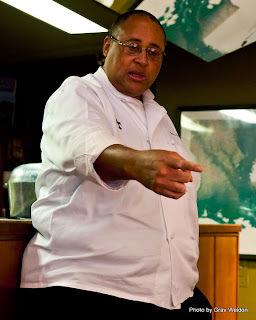 Like the other chefs at the school, he’s full of knowledge and wisdom about southern Louisiana cooking. He’s also full of tales and teasing. I don’t mind that at all. 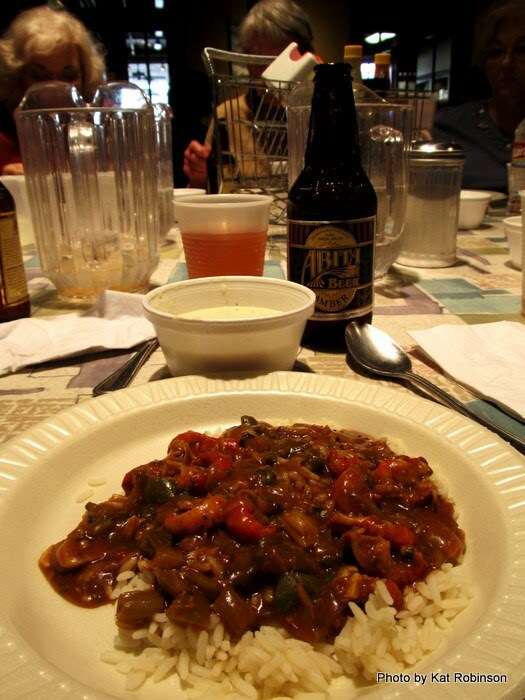 On my most recent visit, we went to learn how to prepare shrimp and artichoke soup, crawfish etouffee and pralines in a Saturday afternoon class. The classroom was packed with folks from all over the United States. Kevin went through the class, asking each of us where we were from. There were a couple there from Wisconsin, which made Kevin wince. “Oooh, Wisconsin. You people are mean up there. We teach our children down here by the time they are three to go unlock the car door, put the key in the ignition and to turn that air condition up to high. You have to have that down here. “I was up there not too long ago. Been working all day and they had this van, it had been sitting all day out there, hadn’t even been started up. Driver gets in, I get into the front seat. He reaches over, turns the lever all the way to as hot as it would go, and then turns on that fan. I was so cold, my eyes were watering. Kevin shares wisdom in the process of making three or four dishes in each class. He’s not alone. I’ve taken classes over the years with the other members of the NOSOC staff. Michael was my first instructor. I went back in 2008 and took the same class I first took in 2000 again, the class on corn and crab bisque and shrimp creole. I’ve taken all the courses there so far -- I did miss out when they used to make catfish, but they don’t offer that now as far as I know. Learned a lot over the years. 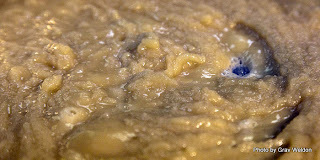 After my first visit I spent hours perfecting my quick-whisked roux. Somehow over the years I hadn’t managed to pick up how to go about making gravy, but afterwards I was making summer sausage gravy, beef gravy, chicken gravy and whatnot. After my second visit I got more adventuresome. I cooked up a pineapple bread pudding for about 200 people at an event. I started making big pots of chicken-and-chicken-sausage gumbo for gatherings with my friends. I made Shrimp Creole for Paul’s dad. The methodology of the class is perfect for my sort of learning curve. I’m entertained. I’m educated. I’m fed. It’s a good meal and about as expensive as what you’d pay for a restaurant that serves up that meal -- $24 for the three-course afternoon classes and $29 for the four-course morning ones. And every single time I go, I really do learn something new. This time around, Kevin showed us how to make a dry roux. “When you whip up that butter, that oil with your flour, you’re cooking it to a certain temperature for a certain amount of time. Roux is like toast. Bread is good but when you toast it, it tastes different. Some people like brown toast. Some like it light. You can make it however dark you want to make it. The interaction is strong and the chefs at the school are always engaging. 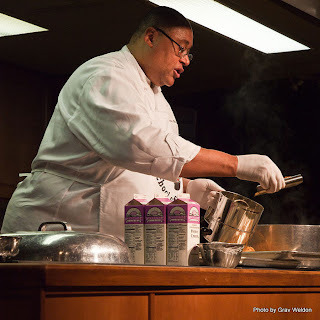 The sous chefs come along at intervals throughout the program, checking the refrigerator to make sure the chefs have what they need, dispersing ice tea and Abita beer and lemonade to the class and providing a little comic relief. “Don’t give that lady a beer, Thaddeus,” Kevin directs one young man. “She’s dangerous.” The crowd laughs. The school, like so many other New Orleans businesses, took a hit after Hurricane Katrina. I went for one of the first classes when they reopened, sitting in on a Thursday afternoon in June 2006 with a friend learning about corn and crab bisque and Shrimp Creole. After that class we talked with Kevin for a while, who recounted to us how the waters had damaged his domicile and how it affected himself and his sons. 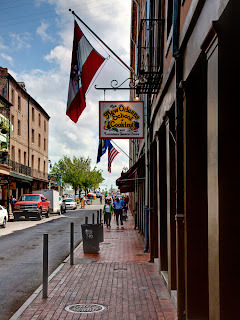 At the time he had urged us to keep up the talk about New Orleans as a destination. And he’s right -- as my subsequent visits to the city can attest. Yes, there are areas that will never be the same. But for tourists visiting the Crescent City, there’s little difference. He doesn’t dwell on Katrina… few do, any more. He keeps on going, teaching and sharing. He got into the next dish, the shrimp and artichoke soup, with pointers all around. “The most important thing to remember when you’re making a cream soup is that it’s a one to one ratio. You can make anything out of it. You can get yourself a butternut squash and cut it up and put it in there for a while and get it real soft and blend it on up. Or you can put that butternut squash in the oven for a while and roast it and then put it in the soup. Or an acorn squash. 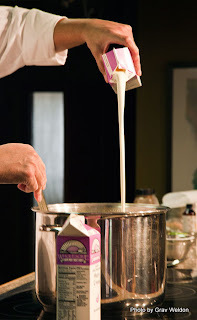 He opened a container of cream to pour into the soup, looking over at my photographer to make sure his camera was ready. My photographer had amused him greatly, taking all sorts of photos along the way. Once he was sure the camera was ready, he poured, continuing the conversation with the class. There was a woman in the crowd who mentioned she was gluten-free, couldn’t eat anything with flour in it. 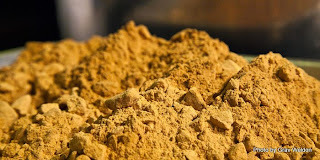 Not only did Kevin give her ideas on other ways to make these food (most involving cornstarch or arrowroot, rice or potato flour or the like), he offered to make her up a plate so she had something to eat that wouldn’t mess with her system. And they’re like that there. 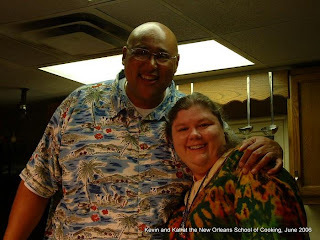 I went before and had sat in on one of Michael’s classes on gumbo and jamalaya -- and he was talking about “you may not like coconut, but you should try the bread pudding even though it has coconut in it. You may think you don’t like Andouille, but you should try it, you will like it.” He saw me take a picture of my plate and not touch it and started to chastise me about it. “I can eat bread pudding and pralines!” I volunteered. He pulled aside one of the sous chefs that walks through from time to time and had a quick conversation with him. The chef brought out some ingredients, and as Michael continued with the demonstration and telling stories, he whipped me up some shrimp and chicken pastaletta, just for me. Now, I’ve been to a lot of cooking classes, but few have ever made sure I would go away full and work around my allergies. I so appreciate that. Almost ever class ends with the making of pralines. Not pray-leans, prah-leens. As Michael once mentioned, pray-lean is what you do after a night of drinking on Bourbon Street -- you lean against a building and pray someone doesn’t see you urinating. Kevin will tell you why you can’t variate from the menu. In each class he explains the history of the praline -- how some French guy sugar-coated almonds and claimed they were healthy. “You got something you like no one’s ever tried before and you want more of it, declare it’s healthy.” He talks about how the French came here and wanted their sugar coated almonds and people told them “we ain’t got no almonds here, use these.” And they used the pecans, because that’s what they had here. He explains why you bring the pralines to softball, not hardball stage. He demonstrates the moment the pralines come off the heat, dropping a little mass of sugar and nut goodness on the paper. “You could wait five years, that praline is never going to set up, never going to harden. Never.” He explains the importance of whipping the air into the mix to bring the temperature down, how if you add a flavor to it that it cools faster and you have to work faster, how you should only make pralines exactly by the recipe because there’s no way you could double the batch and get them out of the pan on time before they hardened up. “I knew this guy, he was going to make this grand meatloaf. He was using his wife’s best cake pan and bragging about it to his daughters. Goes to turn it over and it falls apart everywhere -- he’d been so sure of himself he forgot the breadcrumbs. Turned it out on a plate and told the family it was ‘Ground Beef a la Park.’ "
It’s all goes back to the school’s philosophy. “Anyone can cook,” they tell you. “Use what you have.” And the big thing, they want you to have a good time and come on back… which I plan to do, every time I come through. I may have taken all the classes before, but I always pick up something new. Every single time. You may be wondering why I haven’t shared any recipes with you from my experiences. Frankly, it’s not the same. For one, that’s part of the experience and I shouldn’t take that away from the school. I mean, yes, there’s a book for sale called “Class Act” that features recipes from all the chefs that work at the New Orleans School of Cooking. 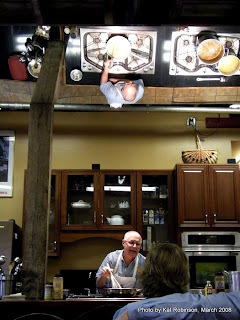 But there are so many nuances to pick up from each chef that changes the way you see each recipe. And there’s the dining. I mentioned how good the food is. You’re not going to get small portions, either. Thaddeus helped pass out bowls of the shrimp and artichoke soup around the room, following them up with Abita beer for whoever wanted it. 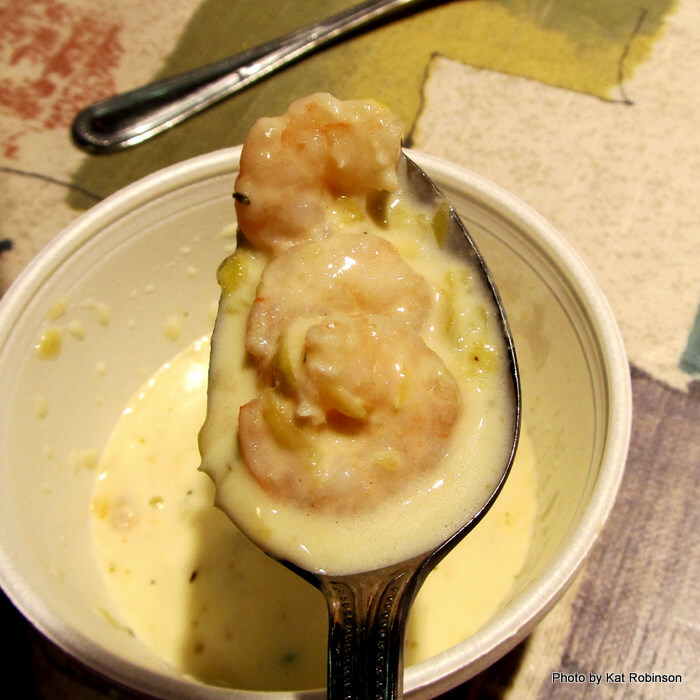 The soup was velvety and deep, those tangy notes of artichoke dancing over the perfectly cooked shrimp, the last item thrown in the pot. The class grew quiet as soup was slurped. Seconds were available all the way around, and several people went up to serve themselves more soup out of the big pot on the counter. 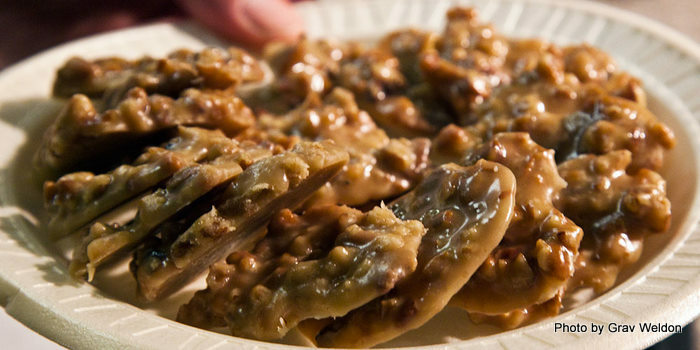 Kevin stacked the now-set pralines on plates and sent them around the room. 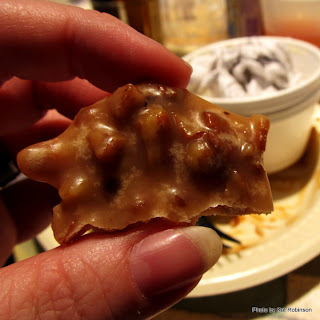 They were perfect in the way true pralines are -- sugary, almost crisp, with that pecan flavor shining through. The edges looked firm but had the consistency of brown sugar in the mouth. These are an addiction of mine, and usually when I spend a good week in New Orleans I have to come by the shop a few times to pick up a couple to eat right then in the Louisiana General Store that makes up the front of the business. These can’t be shipped. After a day, they’ve lost that texture and consistency I am in love with. People who ship pralines are doing something strange to them, I’ve decided. They should never taste like caramel. At the end of class, people slowly filter out. Some have other engagements they head off to. Others, like me, dawdle a bit. On that particular Saturday afternoon I talked with a group of women from Memphis that had been seated with us and shared some business cards, letting them know if they’re ever in Arkansas to let me know and I’d let them know where they should eat. A couple of Canadian women who were also seated with us shared their interest and hung around, too. Some had Kevin sign a cookbook, others just went up to shake his hand. He recognized me. “We have talked before,” he mentioned. I bet he will. I will. And you will likely return yourself, once you go that first time. It’s an experience you should avail yourself of if you find yourself in the French Quarter. I do recommend reservations, as classes tend to fill up. (800) 237-4841 is the phone number, or check out the website -- it’ll tell you what’s being taught in each class. Consider this my recommendation. Thanks for the reminder about this place. You encouraged me to check it out at the Chef Ball. We go in May. Looking forward to going! I usually let people know vi twitter but I didn't see an account for you. Well, have a great day.